If one goes by the letter of the law, be it at the international level or the national legislation of any of the world’s coastal nations, marine mammals are everywhere protected. How come then, that so many species and populations keep declining? In part this is because marine mammal wellbeing clashes with numerous human activities at sea, many of them having substantial economic importance, such as fishing, shipping, looking for oil & gas in the sea bed, military exercises, or more simply the inability of preventing the discharge at sea of garbage and noxious substances. In part, however, the decision makers’ inadequacy in following their own laws derives from the fact that science has been until now unable to provide them with evidence-based, data-robust, user-friendly information on the spatially-explicit whereabouts of the habitats of the various marine mammal populations, which are critically important for their survival. Thus was conceived the idea of Important Marine Mammal Areas (IMMAs), which I set up to describe with friend and colleague Erich Hoyt. In 2013 we created the Marine Mammal Protected Areas Task Force within the framework of the International Union for the Conservation of Nature (IUCN), and the identification of IMMAs in the world’s oceans, seas, lagoons, rivers and lakes became the first Task Force enterprise. IMMAs are discrete portions of habitat, important to marine mammal species, that have the potential to be delineated and managed for conservation. They can be seen as a “marine mammal layer” which represents a pre-selection for consideration by governments, conservation groups, and the general public of areas that deserve consideration for place-based protection. Current work, carried forward by a team of experts including Michael Tetley in the role of IMMA Coordinator, consists in the identification of IMMAs in various marine regions of the world. Regions include the Mediterranean (funded by the Fondation MAVA), and the South Pacific, Northeast Indian, Northwest Indian, Southeast Pacific Oceans and the waters of Australia and New Zealand (funded through GOBI by the IKI Programme of the German Government). In October 2017 the Parties to the Convention on Migratory Species, at their meeting in Manila, the Philippines, adopted a resolution acknowledging the IMMA criteria and process, requesting Parties and inviting Range States to identify specific areas where the identification of IMMAs could be beneficial, and inviting the Convention on Biological Diversity, the International Maritime Organisation and IUCN to consider IMMAs as useful contributions for the determination of place-based conservation. A detailed description of the IMMA project and of the Task Force activities can be found in the Task Force’s website. 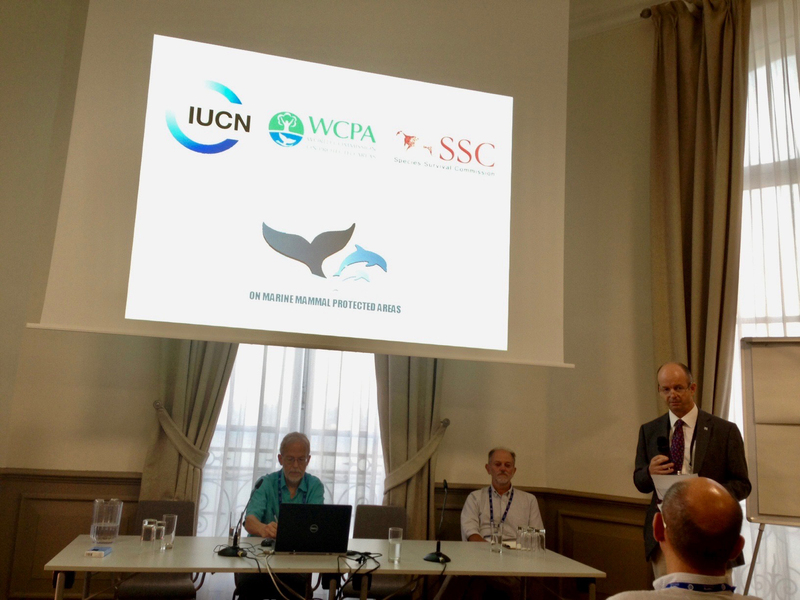 Announcing the establishment of the IUCN Marine Mammal Protected Areas Task Force, Marseille, October 2013. From left to right: Erich Hoyt, myself, Dan Laffoley, IUCN WCPA Vice Chair (Marine).